The extensive foundation (which is usually called raft foundation), is a unified foundation that extends throughout the entire area of the columns. 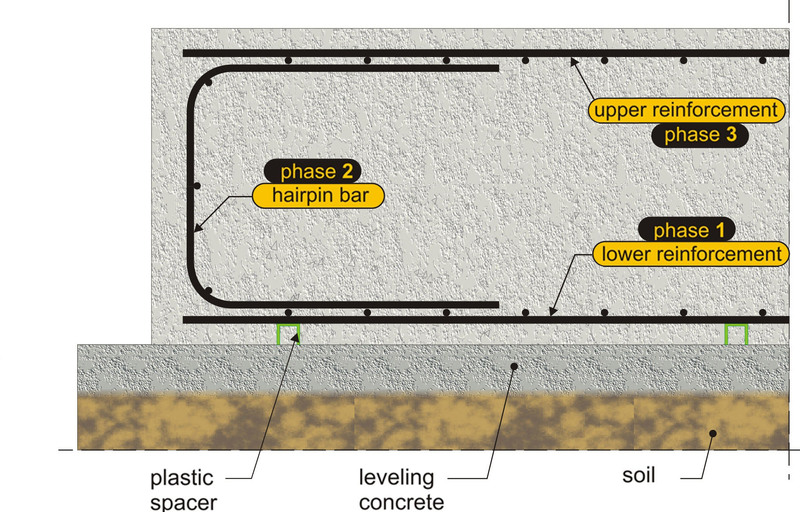 As a rule, raft foundation is used as a building’s foundation when the soil has a low bearing ca-pacity. 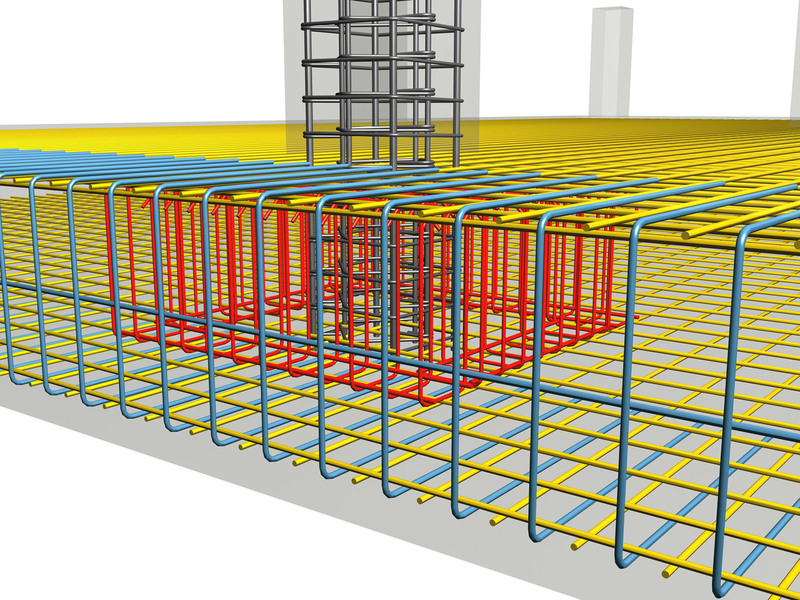 The behaviour of the raft foundation resembles the behaviour of a strip foundation grate. The stresses applied upon the soil are larger in the columns’ area and lighter in the intermediate areas. The presence of beams acting as stiffeners helps in a more even distribution of the soil pressures between the columns’ areas and the intermediate areas of the raft foundation. The raft foundation may belong in one of the following four general categories, (1) ribbed raft foundation, (2) solid raft foundation, (3) raft foundation with hidden beams, (4) mixed raft foun-dation. 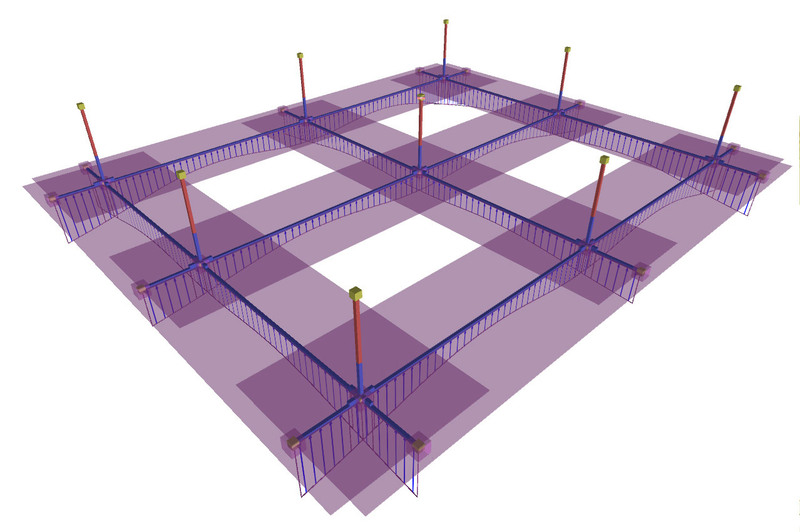 In a ribbed raft foundation apart from the unified foundation slab there are also beams which behave as stiffeners. The beams add stiffness to the foundation and apart from everything else, they level the soil stresses. 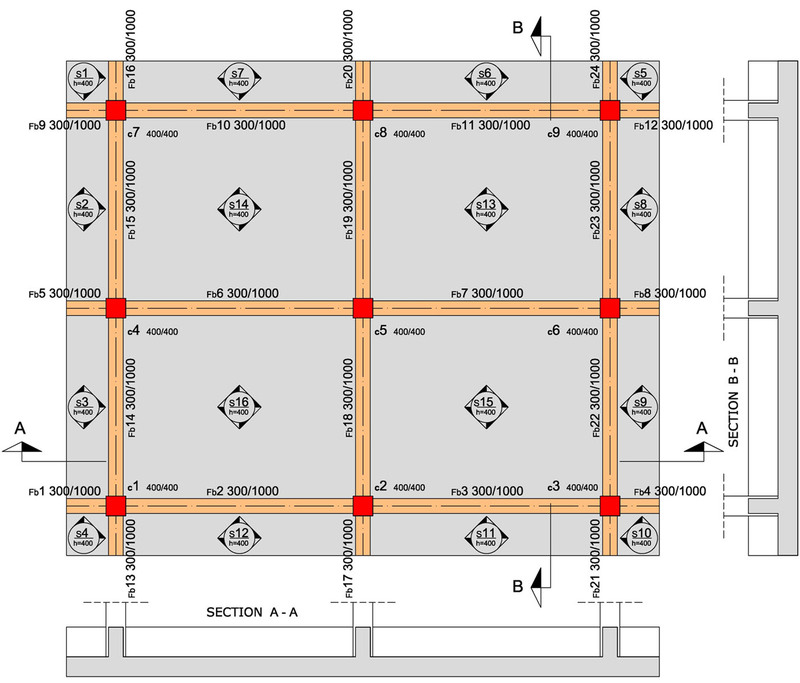 Unified foundation slab (raft foundation) with stiffeners (beams) "project: FoundationRough10"
The formwork’s assembling and the reinforcement implementation of a raft foundation stiffened by beams are two relatively strenuous procedures. The column rebars are in grey color. 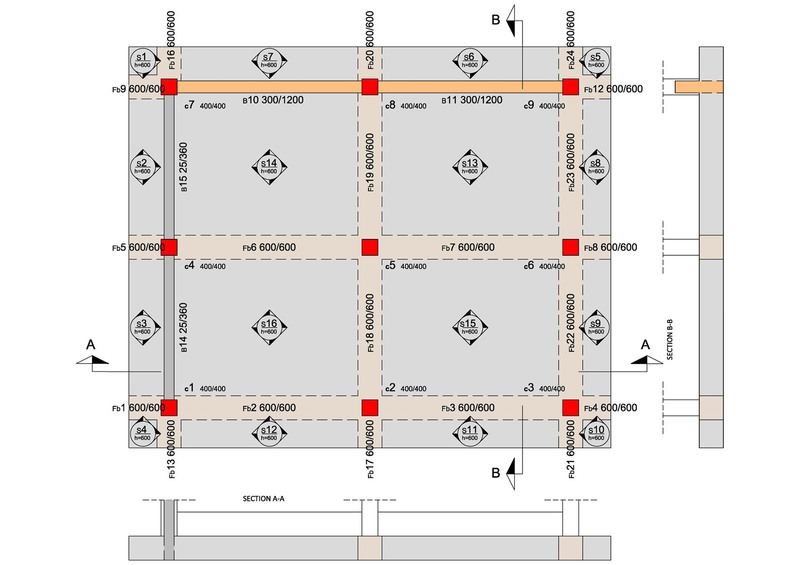 The foundation slabs are reinforced with two wire meshes, one placed at the lower fibers and one at the upper fibers, by following the reinforcement rules that apply to slabs. 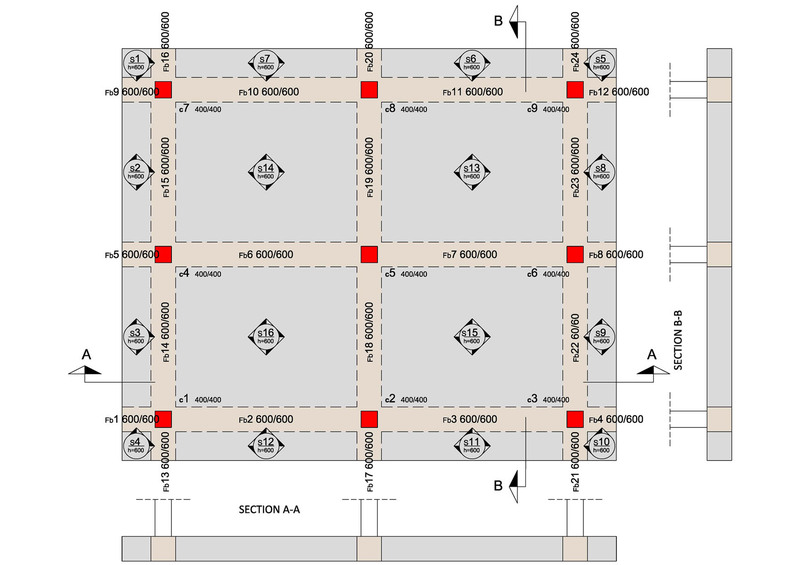 The beams are reinforced with strong stirrups and bars placed both at the upper and lower fi-bers, by following the reinforcement rules that apply to beams. 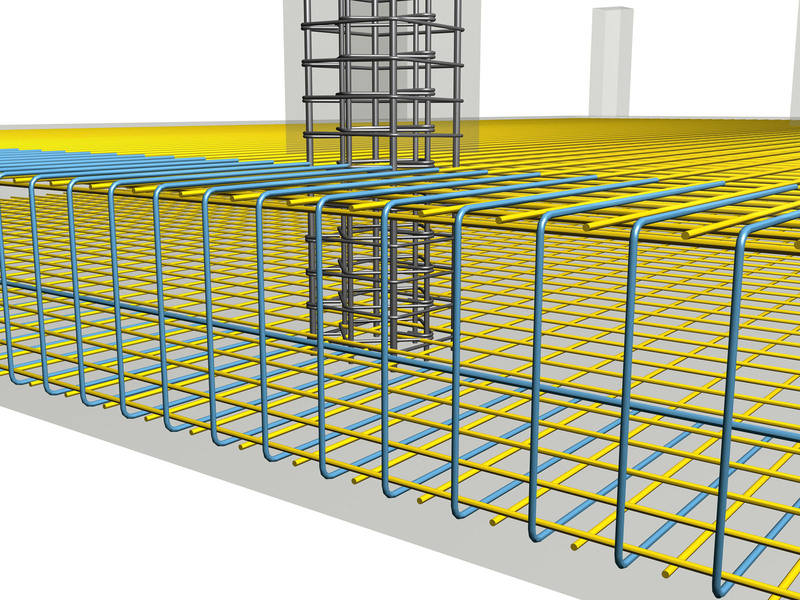 The slabs’ free edges are reinforced with common hairpin bars or with a wire mesh folded like a hairpin, by following the reinforcement rules that apply to slabs. 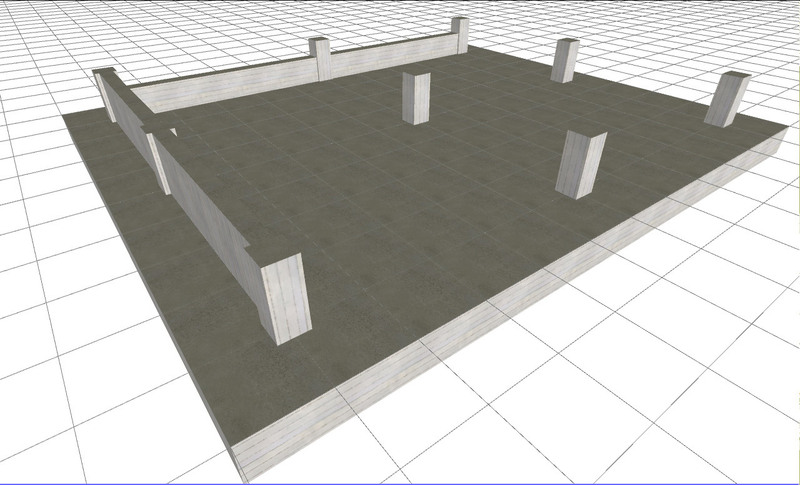 A strip foundation can be stiffened either by beams or by walls. 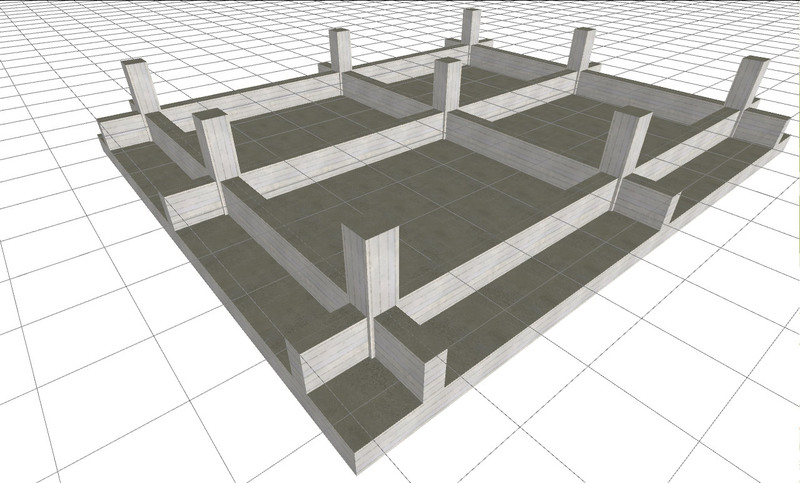 In the latter case, the reinforce-ment of the foundation slab does not depend upon the wall’s reinforcement. The unified solid raft foundation is the most simple foundation form and its formwork assembling as well as its reinforcement implementation do not require hard labor. 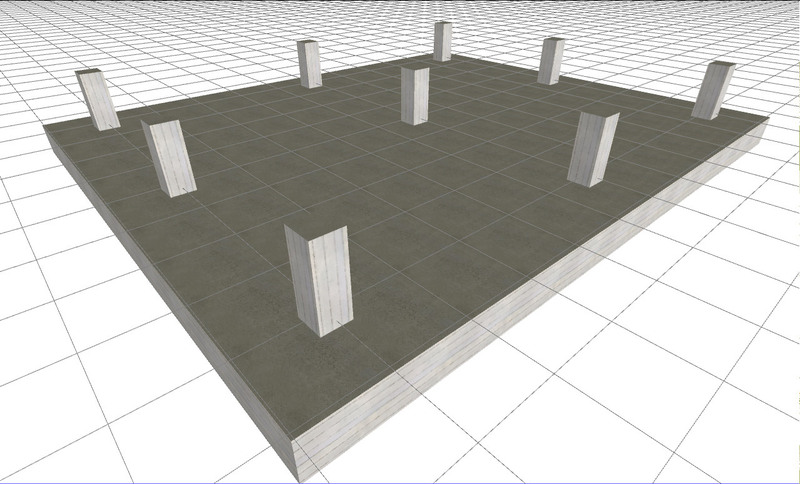 In the solid raft foundation, there is only one unified foundation slab. 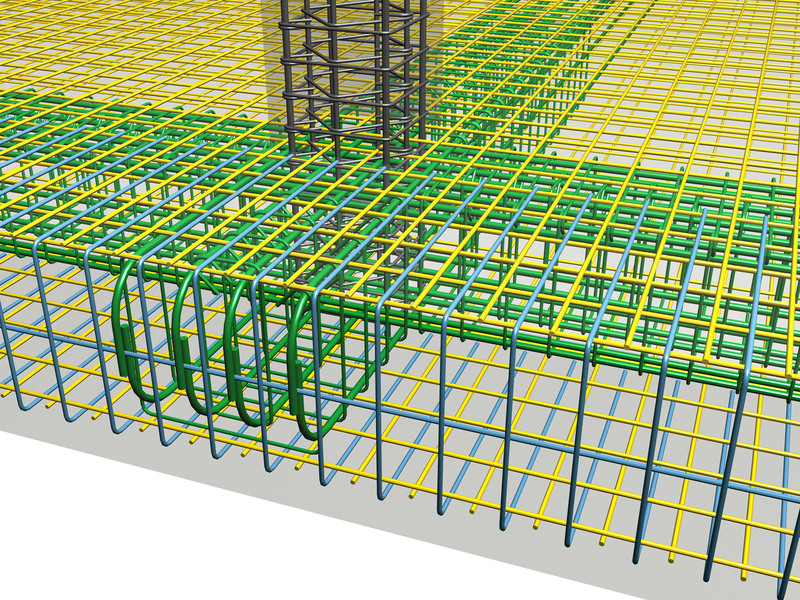 The foundation slabs are reinforced with two wire meshes, one placed at the lower fibers and one at the upper fibers. Since the most intense stresses appear along the columns’ axis, their surrounding areas are usually reinforced with stronger or double grates. The slabs’ free edges are reinforced with common hairpin bars or with a wire mesh shaped like a hairpin. 1. On a practical level and mainly when using a folded wire mesh as a free edge’s reinforcement, the hairpin rebars are positioned in the 2nd phase, as shown in the first figure. 2. 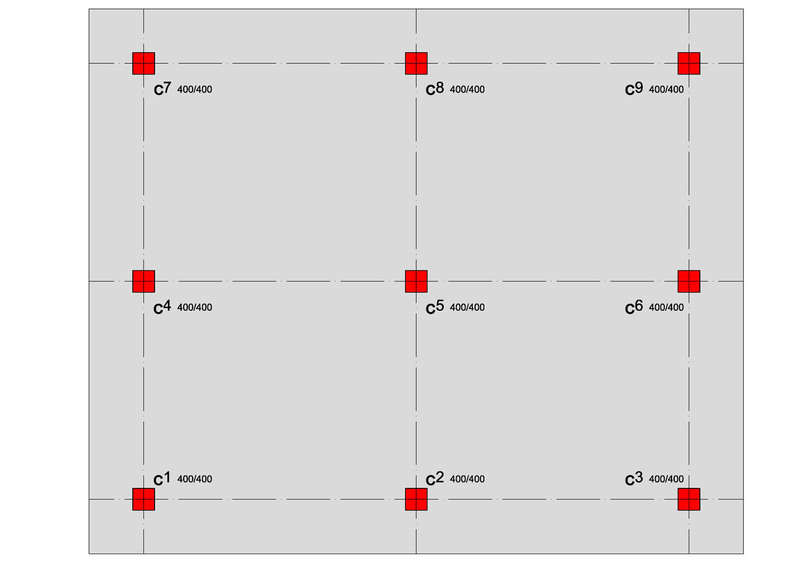 The alternative solution for providing the free edges’ reinforcement includes the formation of hooks at the ends of the upper and lower rebars as shown in the second figure. This solution compared to the hairpin solution, apart from everything else, has a higher shaping-cost but mainly it lacks a natural peripheral rebar chair. The punching shear reinforcement, when it is required, is similar to the one used in the isolated spread footings of paragraph 3.7.1, as shown at the following figure. When the columns are subjected to large loads and the foundation slab’s thickness is analogi-cally small, it is obligatory to use punching shear reinforcement. 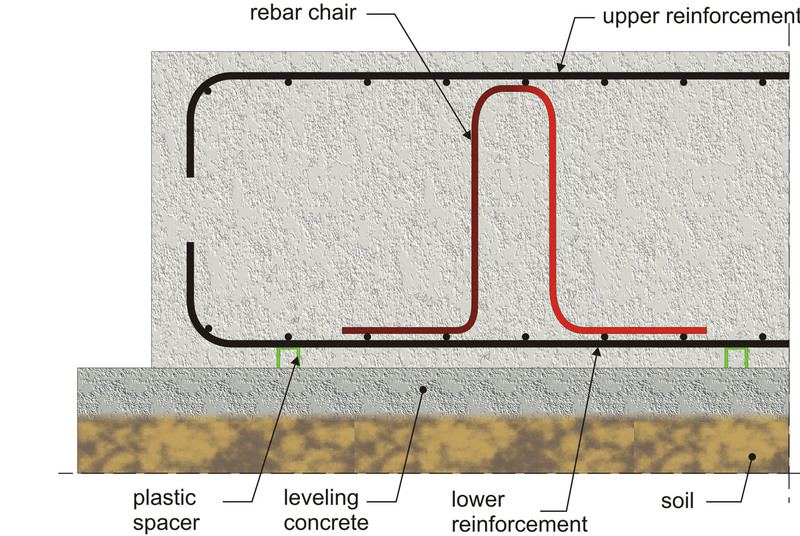 That reinforcement can be pro-vided by stirrup cages, as it is in this example, by bundles of properly bent rebars or by special industrial elements. In a raft foundation with hidden beams, the foundation slab is unified and has no additional stiff-eners. 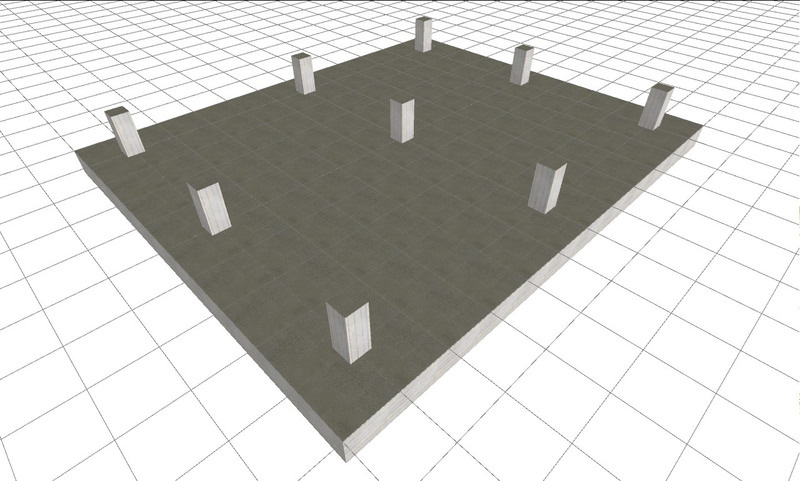 This means that geometrically, it is as simple as the previous case. Its formwork assembling does not require a lot of effort as opposed to its reinforcement imple-mentation. Raft foundation with hidden beams "project: FoundationRough20"
The reinforcement of the raft foundation with hidden beams is the same with the reinforcement placed inside the ribbed slab foundation. The only difference lays in the fact that the total depth of the beam-stiffener is equal to the slab’s thickness. The stirrups placed inside the hidden beams may be two-legged or four-legged (as they are in this example). On other occasions, stirrups with more than four legs can be used. The mixed raft foundation is an extensive foundation which is partially stiffened by beams or by walls. Mixed raft foundation "project: FoundationRough40"
This specific raft foundation includes solid parts, parts stiffened by beams and parts stiffened by walls. 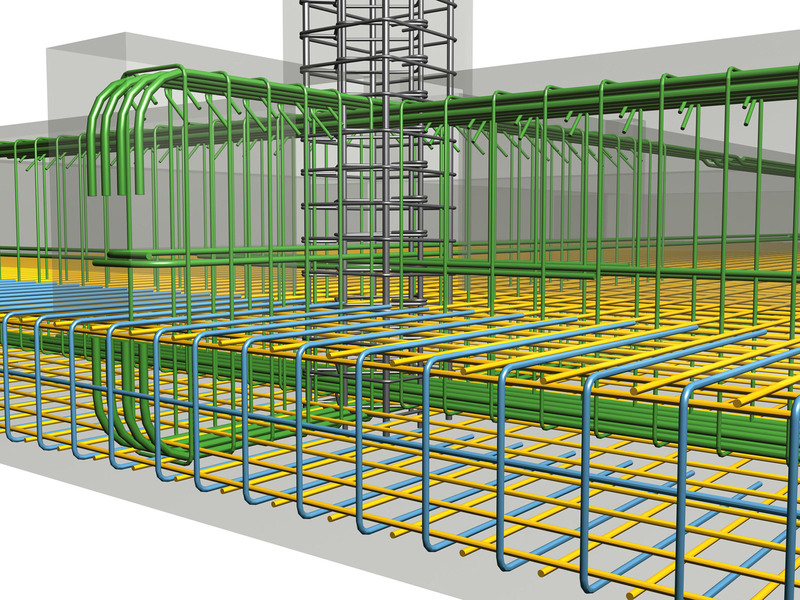 The formwork assembling and the reinforcement implementation of a mixed raft foundation in-volve a lot of difficulties however, sometimes, it is an unavoidable solution e.g. in basements where it is obligatory to have shear walls.